Spray 3 1/2- to 4-quart slow cooker with cooking spray. Place chicken in slow cooker. In small bowl, stir together barbecue sauce and Buffalo wing sauce. Pour over chicken wings. Stir to coat. Set oven control to broil. Spray broiler pan rack with cooking spray. Use slotted spoon or fork to place chicken on rack in pan. Broil with tops of chicken 3 inches from heat 3 to 4 minutes or until browned, turning halfway through broiling time. Serve with remaining sauce for dipping. Garnish with lime wedges and green onions. 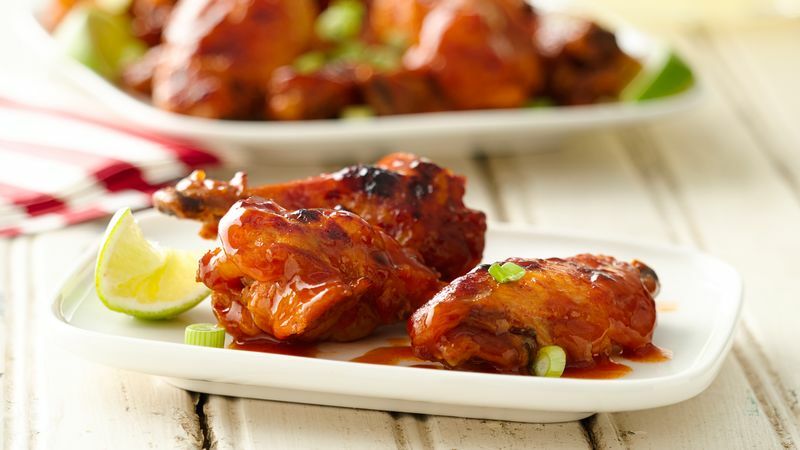 If you like your wings a little on the hot side, swap a little more of the barbecue sauce for additional buffalo sauce. Or, if you like a milder wing, add more barbecue sauce and less buffalo sauce. Buffalo chicken wings are said to have gotten their start, and certainly their claim to fame, at the Anchor Bar in Buffalo, New York in 1964. Now, Buffalo wings are a staple snack at parties and football-watching get-togethers. Not all of us can make a quick trip to the Anchor Bar though, and that’s where this genius recipe comes in handy. You only need four ingredients and the slow cooker does all the work for you. Slow-cooker chicken wings are just the beginning. You can use the slow cooker for all kinds of chicken dinners and appetizers, and we have the recipes you need to get started. Feeling especially ambitious today? Learn how to cook a whole chicken next.